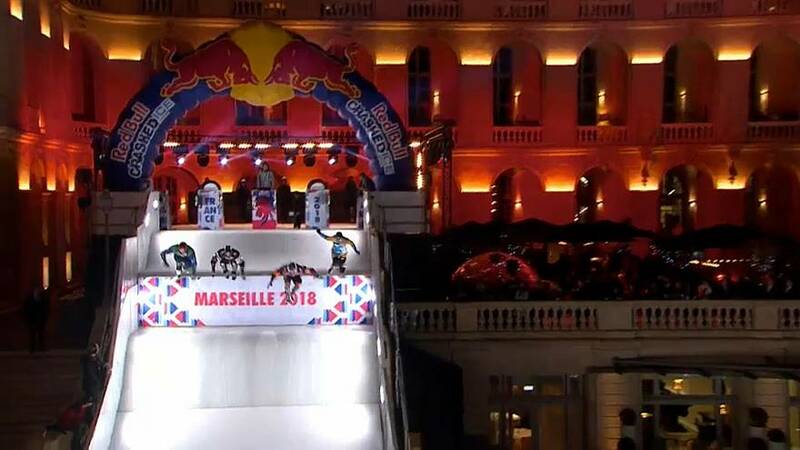 Incredible high-speed passing maneuvers, bone-jarring crashes, heart-stopping action and clutch performances made the Red Bull Crashed Ice race in Marseille one of the most exciting ever. American Cameron Naasz kept his hopes for a third straight ATSX Ice Cross Downhill World Championship alive with a dramatic win as did Canada’s Jacqueline Legere in the women’s competition. Naasz blasted out of the starting blocks in a pressure-packed Red Bull Crashed Ice final on a treacherous ice track in Marseille on Saturday and never looked back, winning with the most brilliant performance of his career. The victory for Naasz, who beat Canada’s Scott Croxall into second place, kept his hopes for a third straight Ice Cross Downhill World Championship alive. Croxall moved just ahead of Austria’s Marco Dallago into first place in the standings with Naasz a close third overall with three races left.